What size sampler are you interested in purchasing? What size sampler are you interested in purchasing? 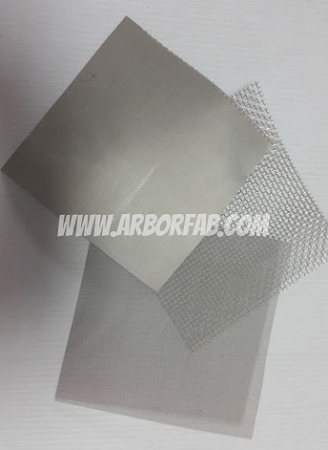 5 15 43 74 100 120 149 177 234 300 400 500 600 800 1000 1526 1/8" 1/4"
Add a 2nd size screen sample? Add a 2nd size screen sample? 5 15 43 74 100 120 149 177 234 300 400 500 600 800 1000 1526 1/8" 1/4"
Add a 3rd size screen sampler? Add a 3rd size screen sampler? 5 15 43 74 100 120 149 177 234 300 400 500 600 800 1000 1526 1/8" 1/4"
Add a 4th size screen sampler? Add a 4th size screen sampler? 5 15 43 74 100 120 149 177 234 300 400 500 600 800 1000 1526 1/8" 1/4"
Add a 5th size screen sampler? Add a 5th size screen sampler? 5 15 43 74 100 120 149 177 234 300 400 500 600 800 1000 1526 1/8" 1/4"
These 12" by 12" samples come in the following sizes and are used to help you determine which size micron you require for your use: 5, 15, 43, 74, 100, 120, 149, 177, 234, 300, 400, 500, 600, 800, 1000, 1526 Micron, 1/8" and 1/4" Stainless Steel Mesh. Unlike plastic filters, stainless steel filters are chemical resistant and can be used in extreme hot and cold temperatures. The are extremely durable, can be used with most liquids and are easy to clean and maintain. The 5, 15 and 43 Micron screens are made from 316 Stainless Steel, all other micron sizes are made from 304 Stainless Steel.